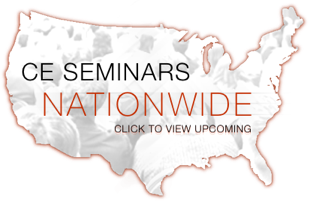 Earn 16 C.E.U.s with our Dental Sleep Medicine Seminars! Two days, and 16 CEs will leave you with the confidence and knowledge to successfully screen and treat your patients for sleep apnea. Our expert instructors will teach the proper way to treat patients with sleep apnea and share a wealth of knowledge and unbiased information. Our expert instructors will teach the proper way to treat patients with sleep apnea. Take an online quiz on Free CE Dental and earn a continuing education credit, absolutely free! Dr. Snyder speaks about his home sleep testing experience. Dr. Welch gives the SGS Seminar a raving review. Our 16 CE courses are in depth, hands on, and lead by the best instructors in the industry. DentalSleepSeminars.com is your online resource for continuing education credits, focusing on the popular topic Dental Sleep Medicine. The screening and treatment of OSA, Obstructive Sleep Apnea is becoming a staple in many dental offices across the country, and around the world. Orthodontists, dentist and hygienists from across the globe attend our live two day seminar in hopes of creating a healthier patient population through screening and treating sleep apnea. In Need of Dental CE’s? In conjunction with Sleep Group Solutions, all Dental Sleep Seminar courses are focused around screening and treatment of Obstructive Sleep Apnea (OSA) within your existing dental practice. Two days, and 16 CEs will leave you with the confidence and knowledge to successfully screen and treat your patients for sleep apnea. We encourage those looking for continuing education credits to explore the rapidly growing and exciting world of Dental Sleep Medicine. Earn dental CEUs while learning the latest in Dental Sleep Medicine. Treatment of sleep disorders is one of the fastest growing fields of medicine and recent developments have put dentists on the front line. With Obstructive Sleep Apnea reaching epidemic levels in our society you have a unique opportunity to save the lives of those suffering while adding a valuable service in your practice.